One of the best of RCA's Stereo Action series! 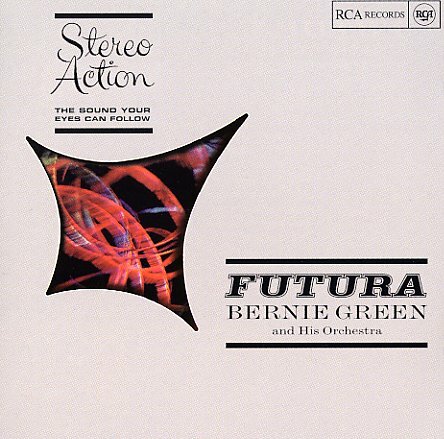 Bernie Green leads his orchestra through a set of material that tries to answer the question "What will pop music sound like in 1970?" (keep in mind that this is 1961) – and a number of the tracks feature a "guitar orchestra" that sounds really really great, with a wide-open sound that's totally wonderful – the best realization of the RCA stereo sound of the time! The record's got a vague bit of electronics mixed with the guitar, plus a bit of vibes – and the whole thing aptly earns its Futura tag with a space-age approach to the music. Titles include "Futura", "Steel Bones", "Kiss of Fire", "Pentagon", "Out Of This World", and "Ping Pong". © 1996-2019, Dusty Groove, Inc.